New Chrysler, Dodge, Jeep, Ram Special Offers | Elk River’s Best Deals " "
When you’re looking for a new Chrysler, Dodge, Jeep, Ram in Elk River, you want to ensure that you’re getting the best deal possible. 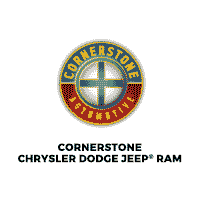 And when you rely on the new vehicle specials at Cornerstone Chrysler Dodge Jeep Ram, you can be confident that you are. Thanks to our rotating Chrysler, Dodge, Jeep, Ram deals, you can get behind the wheel of that new Ram 1500 you’ve had your eye on for a price you can feel good about. Once you’ve browsed our online inventory, it’s time to meet your match in person! Visit our dealership near Rogers to view our discounted Chrysler, Dodge, Jeep, Ram in Elk River – you won’t be disappointed. New vehicle pricing includes all offers and incentives. Tax, Title and Tags not included in vehicle prices shown and must be paid by the purchaser. While great effort is made to ensure the accuracy of the information on this site, errors do occur so please verify information with a customer service rep. This is easily done by calling us at (763) 441-2300 or by visiting us at the dealership.